The Belmont Stakes has come and gone, but a full month still remains at the Belmont Park spring/summer meet. Contained herein are some tips and trends to help handicappers finish strong as the Belmont meet comes down the home stretch. 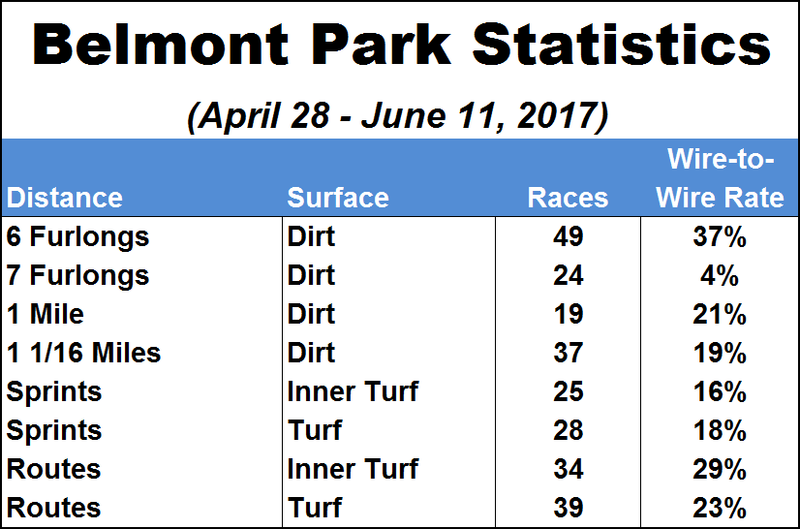 With a half-meet worth of statistics to sink our teeth into, horseplayers who have been paying attention have accumulated a solid set of data from the Belmont meet so far. Therefore, let’s attempt to delve into some key statistics and angles in order to formulate a successful plan for the remainder of the meet. As always on Belmont’s dirt track, speed is an extremely handy commodity. Sure, late runners will have every opportunity to close at Belmont with its wide sweeping turns and long stretch, but front runners and pressers always have an edge. This season has been different, with the possible exception of speed horses racing on a rail that has been more or less questionable all meet long (at least thus far). Besides the prevailing speed-favoring nature of the Belmont main track, there are usually day-to-day track biases that affect the results and either help or hurt the chances of certain horses on any given afternoon. This year, as detailed below, the Belmont spring/summer season has seen more than its share of days with a pronounced track bias. When you see these biases appear, it can prove valuable to take notice so you can capitalize on the horses affected by them – both positively and negatively – when they return to the track for their next starts. In other words, it helps your chances to downgrade horses who benefitted from biases last time, while also upgrading the chances of horses who’ve been hurt by track biases in their past performances. Below is a list of the biases I’ve observed during the current Belmont meet (thru June 11). These are largely subjective, of course, but should not be overlooked by handicappers in search of an edge. June 11 – Outside advantage. June 9 – Slow rail, outside path advantage. May 29 – Outside bias, slow rail on sloppy track. May 28 – Rail much better than usual. May 26 – Helped to be on or close to the pace. May 21 – Outside preferred. May 20 – Outside was best part of the track. May 19 – Outside paths proved best. May 14 – Had to avoid the rail on a drying muddy-good-“fast” track. May 13 – Deep rail, outside good on sloppy sealed track. May 10 – Outside good. May 5 – Speed bias, couldn’t close on sloppy sealed track. April 30 – Had to be on or close to the pace. April 28 – Slow rail outside advantage. As you can see, the main track has been affected by biases on many racing days this season. The main prevailing bias to impact the meet has been a slow rail, which has had an effect on racing for much of the meet, to varying degrees, depending on the particular day. Be on the lookout for horses coming back for their next starts after exiting dirt races on those dates. Downgrade the horses that took advantage of bias-aided outside trips and upgrade horses in their next starts that were stuck down on the rail. The weather has been chilly and often rainy in New York during the first half of the 2017 Belmont spring/summer meet and this is going to play a huge role in handicapping the last month of the meet in terms of the turf races. On the Belmont turf courses, under dry conditions, speed tends to play a lot better than it does under wet conditions or wet-and-dry conditions. Thus far in the meet at Belmont, the turf courses have mainly been less-than-firm, even when listed “firm” on the tote board. Such conditions typically help the closers at Belmont, with the best trips of all being the “inside-out” rallies. This is expected to change drastically, however, during the last month of the meet when the weather usually dries out and heats up in the area surrounding Belmont Park. Under dry, sunny, warm conditions, the “firm” turf at Belmont is often very different than the “firm” turf conditions encountered during May. It is at this point that the turf courses have been known to go from favoring the rally-wide, inside-out trips to favoring speed and pressers during June and July. This leads to great betting opportunities in the Belmont grass races during the upcoming warmer and drier part of the spring/summer meet. Closers that ran big races early in the meet often don’t repeat those efforts and should be downgraded as underlays you can bet against. Frontrunners and pressers, on the other hand, often were at a disadvantage in May, but should be in store for positive turnarounds during June and July when the turf dries, hardens, and begins to favor their running style. Speedy losers from May often turn into longshot value-added winners in June and July. This season’s Belmont jockey standings have featured several good storylines, including the renewal of what has reliably turned into an annual battle for the riding title between Jose Ortiz and Irad Ortiz. Through June 13, Jose leads the standings with 36 wins (19 percent) and Irad is close behind with 34 wins (18 percent). Both Ortiz brothers have managed to carve out a giant lead in the win column over veterans like Javier Castellano (27 wins) and John Velazquez (25 wins). Note, however, that both Castellano and Velazquez have similar win percentages as the Ortiz brothers, so their inferior win totals are mostly due to them accepting fewer mounts. Velazquez is still, by far, the leading rider of two-year-olds at the meet with five wins from 11 mounts (thanks mainly to his association with trainer Todd Pletcher) and Castellano is the leading turf jockey at the meet with 18 grass wins and a big 24-percent win rate. When comparing the Ortiz’s, both have similar stats in most categories. The main difference between the two is in the average win payoffs of their runners at the current meet. Jose Ortiz brings in better-priced horses with a very decent average win payoff of $10.50 for his 36 winners. Compare that with much lower average win payoffs for Irad Ortiz ($7.30), Javier Castellano ($6.20) and John Velazquez ($7.80). A couple of other jockeys worth mentioning include Cornelio Velasquez, who has 12 wins from only 88 mounts (14 percent) and is riding a bunch of winners for trainer Linda Rice and is the undisputed top jockey on the grounds in turf sprints. Manny Franco is fourth in the jockey standings with 26 winners and his average win mutuel is a very solid $12.20. Speaking of average win prices, the one jockey amongst the top group at the meet that continually gets overlooked on the tote board, and therefore offers the best ROI, is Luis Saez, who is 19-for-112 (17 percent), but also boasts a healthy $16.00 average mutuel. This makes Saez a great bet at Belmont. 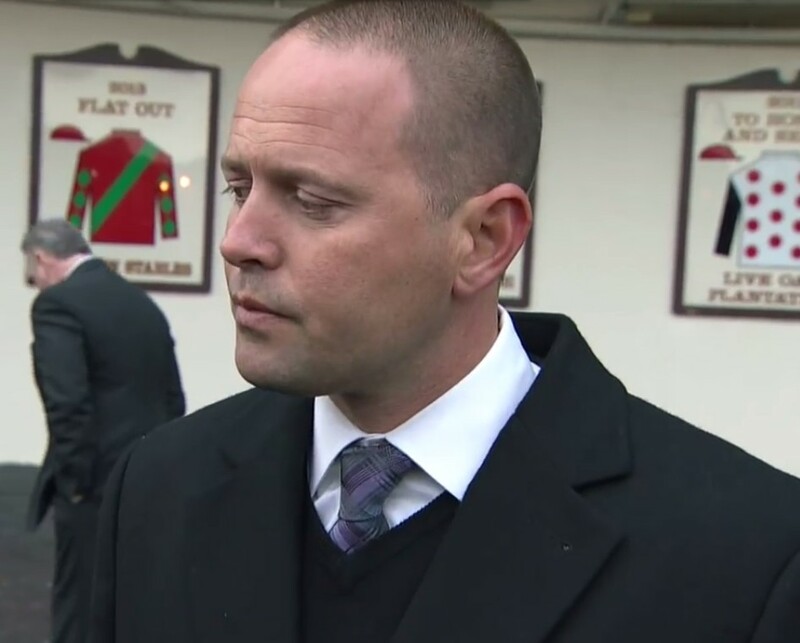 Chad Brown is running away with the Belmont trainer title with 30 wins, including 22 turf wins. Brown is one of the country’s top trainers, but he has always had to play second fiddle to Pletcher at Belmont Park. For bettors, Brown is a conundrum because you can’t go against him consistently, but you also can’t make much money betting on him. A total of 21 of his 30 winners (70 percent) at the Belmont spring/summer meet have been favorites. Other trainers who are currently sitting in a lofty stratosphere in terms of win percentage and cannot be overlooked include Jason Servis, who is 9-for-27 (33 percent), which actually represents a cooldown from where he had been earlier at the meet, Jeremiah Englehart (9-for-28, 32 percent, 75 percent in-the-money) and, more quietly, Robertino Diodoro, who is 8-for-26 (31 percent). In terms of percentage, you also want to bet Brad Cox now, based on his 5-for-11 record (all wins on the turf). Of course, you can always count on Pletcher, who is second in wins with 17, but his win rate is just so-so — for him — at 21 percent. This means one of two things for handicappers: Pletcher’s runners will explode during the second half of the Belmont meet or he is already gearing-up for a giant meet at Saratoga. One category to bet Pletcher in right now is with two-year-olds. He already has won four juvenile races, which tops Wesley Ward (three juvenile winners) and Englehart (two). The other trainer you really need to start watching and wagering on right now is Linda Rice, who is fourth in the standings currently with 11 wins (18 percent). Rice is the queen of the turf sprints, but has racked up her wins at the meet despite only two total turf wins. This means she has a barn full of horses ready to win turf sprints — either at Belmont or at Saratoga, and you must bet her accordingly. Enjoy a successful final month of the Belmont meet and, remember, the meet doesn’t end just because Belmont Stakes Day has come and gone. Hopefully, the information in this article will help raise your own personal winning percentage and make the meet profitable from here on out. Continue to keep a close eye on the winning track trends the rest of the way and you will stay one step ahead of the competition.